Today, my challenge is to draw a Pokémon. For this one, I chose one of my favourite Pokémon, Plusle. I love the electric rodents because they are cute but somewhat powerful (they're not the strongest but they make up for it with their charm). While struggling to find a Pokémon that was easy to draw, my eyes turned to the Minun soft toy I have. I then thought of drawing Minun's "cousin", Plusle. Using the instructions from Drago Art, I drew a Plusle. It was fun drawing Plusle and maybe I'll draw Minun in the future. Maybe in the future, there could be an electric rodent that is an Australian rodent (e.g. antechinus, bilby etc.). 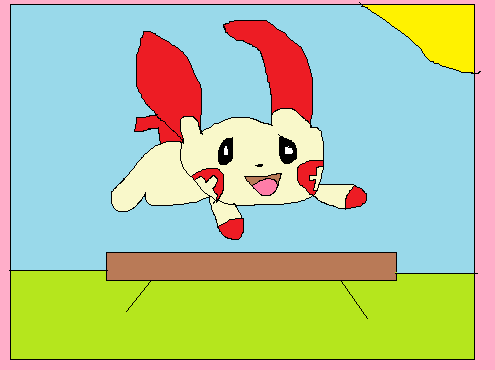 Above: My drawing of Plusle. I know it's not perfect but I rarely use Paint and not everyone can be a talented artist, despite what you think when you see fanart.